Centuries and centuries ago, aboriginal dogs of similar type were distributed over a vast area of northeastern Europe, from Finland eastward, including Karelia, provinces of the European part of Russia and Siberia. The term aboriginal refers to a dog that was the first of its kind present in a certain geographic region of the world, as discovered and described by travelers, naturalists and ethnographers (resesarchers who believe that all the properties of a given system -- including biological, chemical, social, economic, mental, and linguistic -- can only be explained by studying the system of the whole, because the system determines, in an important way, how the component parts behave.) Aboriginal dogs are usually primitive dogs, whose evolution was based on survival of the fittest with little (if any) influence from man. Centuries ago, the strong bond that hunters had with their hunting dogs made it easier to provide meat for their families. Animal pelts could be traded for other essentials such as flour, gun powder, and tea. It was in the taiga forest zone of northeastern Europe, one of the world's coldest climates, that hunters and their dogs lived together and survived together. 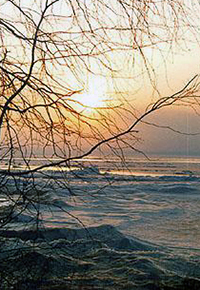 Long, severe winters lasted up to six months, with mean temperatures below freezing. Short summers saw only 50 to 100 frost-free days. Even with average annual precipitation of only about 15 to 20 inches, low evaporation rates made it humid. Throughout time, glaciers that once covered the region have receded, gouging out depressions that then filled with water, creating many lakes. Below is a photo of the taiga at Lake Baikal in southern Siberia in Russia. The history of dogs in every region is linked to the history of the people with whom they lived. All modern breeds were "native" to some area, where they developed as a local variety through some combination of natural selection (where the fittest dogs survived to breed) and selective breeding (by which man selected dogs for breeding based on certain specific appearance and beharior qualities). Below, Karelia, after whom the dogs are named, is the land of the Karelian people, a vast area in Northern Europe of historical significance for Finland, Russia and Sweden. 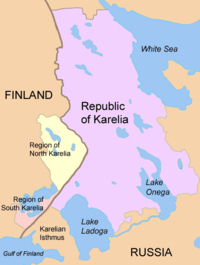 After centuries of conflict among these three peoples, the territory is now divided between the Russian Republic of Karelia, the Russian Leningrad Oblast, and two Regions of Finland: South Karelia and North Karelia.